The Rolodex of madness is ever-growing, and in today’s southeastern U.S. news, a man was arrested for driving a golf cart on surface roads—not a golf course—while reportedly three times over the legal limit. In this instance, the culprit was Fireball, everyone’s least favorite shot to receive at a bar from an overzealous college friend. Hooks seemed groggy, his eyes were watery and bloodshot, he smelled of alcohol and he had difficulty answering simple questions, including when he was asked for his name, investigators said. They said he became very defensive when he was asked for his address and his date of birth. 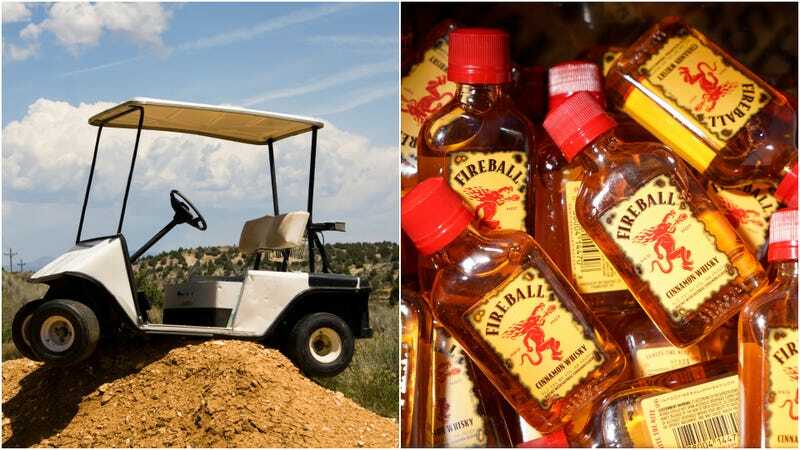 Has anything good ever happened in the wake of cracking open a bottle of Fireball, to say nothing of subsequently getting behind the wheel of a golf cart? It unleashes something almost Four Loko-ian in the consumer. In that respect, it might make for a solid official Sunshine State whiskey. Also, as a reminder that we should not have to give but always will, never drink and drive, ever, for any reason. No, it does not matter what you’re driving.